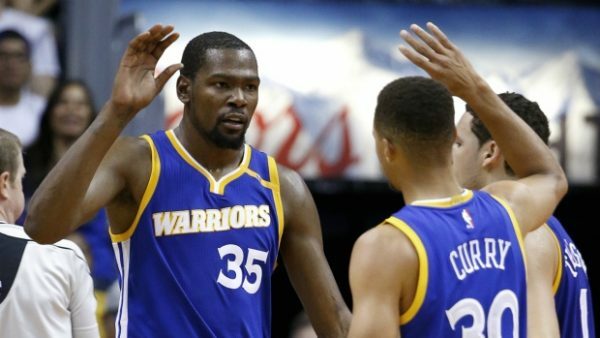 No surprises in a Sunday of NBA basketball, as the Golden State Warriors struggled but overcame their visit to the Phoenix Suns, led by a scorching Kevin Durant. Kawhi Leonard provided a strong finish as the San Antonio Spurs beat the Miami Heat, and the Oklahoma City Thunder got another triple double from Russell Westbrook in a comfortable win against the Los Angeles Lakers. Utah Jazz 75 Los Angeles Clippers 88: While Gordon Hayward is injured, the Jazz are going to have some ugly offensive nights, shooting just 39.7% from the field. The Clippers ran away with the game in the second half, led by 18 points from Blake Griffin, who had a double double in an ugly game of basketball. Golden State Warriors 106 Phoenix Suns 100: The Suns remain winless, doing a good job of catching up in the final minutes but falling short of an upset. Kevin Durant scored 37 points to lead the Warriors, helped out by 28 from Stephen Curry. T.J. Warren scored 26 for the Suns, who also got 21 from Eric Bledsoe. San Antonio Spurs 106 Miami Heat 99: Another big game for Kawhi Leonard, scoring 27 points, 14 of them coming in the final six minutes. LaMarcus Aldridge didn’t play, so Pau Gasol took a bigger role and scored 20 points. Patty Mills had another big night, this time off the bench, scoring 18. Hassan Whiteside led the Heat with 27 points and 15 rebounds; Goran Dragic scored 25. Milwaukee Bucks 83 Detroit Pistons 99: The Bucks looked terrible on offense, shooting just 23.5% from three, struggling against a Pistons team with every member of the lineup scoring in double figures. Andre Drummond had a 20 points, 23 rebounds double double, but Kentavious Caldwell-Pope led the team scoring 21. Los Angeles Lakers 96 Oklahoma City Thunder 113: The Russell Westbrook tornado swept through Oklahoma City, getting another triple double, this time with 33 points, 12 rebounds and 16 assists, although 7 turnovers were part of the package. The Lakers were just 7-for-32 from beyond the arc, led by D’Angelo Russell and Julius Randle, both scoring 20 points. Washington Wizards 103 Memphis Grizzlies 112: The Grizzlies leaned on their veterans to pull the win off: Conely with 24 points, Zach Randolph with 22 points, Marc Gasol with 20 points and even Vince Carter scoring 18 points. The Wizards, led by 22 from John Wall, still haven’t won. Dallas Mavericks 92 Houston Rockets 93: Another team without a win are the Dallas Mavericks, as the Houston Rockets won in the final second thanks to James Harden hitting one of two from the line. Harden had 28 points with 8 assists, but he also shot 8-for-23 from the field and turned the ball over 8 times. The Mavs, without Dirk Nowitzki, were carried by 25 points from Justin Anderson.